This isn’t one of those beachy, wine tastey, coastal scenic drives that you can comfortably cruise along, stopping for gourmet food at a whim’s notice. However, it’s one of the most iconic drives in the country. As many of you on here will be Adelaide locals looking to sell your car, make sure that if this is a last hoorah then your car is in good working order, otherwise, save it for you new and improved vehicle after you sell. The total distance of this drive is anywhere from 1,500 to 2,000 kilometres or more, depending on how many stops you’re interested in taking. In all it’s roughly 17 or 18 hours driving time, but you won’t want to do it all in one go. It’s best to have at least three or four days to do this one, and then you can shoot back on the way home. The following information is really so you know where you can refuel your car and your belly and to make sure you’re safe out there. The outback is a magical place, but it’s also a real place and some precautions are appropriate. 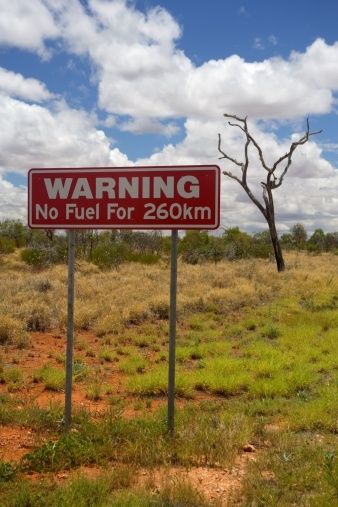 One of the many things to be aware of on your way to the outback. Just a few little pointers before you head out: Make sure you’ve got lots of extra water on hand, as well as a spare tire and any tools you would need to put one on. Make sure your car has been serviced recently. 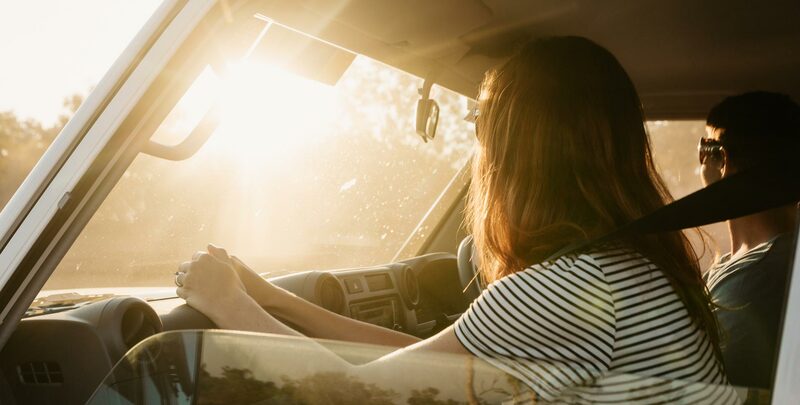 If you’re not used to long drives across great expanses of empty desert, you might want to think about audiobooks or bringing along guests that can keep you entertained. Bring enough time and patience so that you won’t be tempted to drive through the night, there are many animals on the road and some of them are large. Keep in mind that only Telstra gets service in most places, and in many places there will be no phone service at all. There are places to stay in cabins along the way but you might like to have your own tent, or sleep in your car. Take your time and absorb the sprawling wonder of the outback. It’s a good idea to travel with friends to ease the expanses of long desert stretches. Leaving Adelaide you’ll want to drive north on Port Wakefield Road, which is also called Highway 1. This part might take a little while because you’ll be inching along with everyone else trying to get out of the city. A lot of them will turn off to go towards a relaxing few days in of wine tasting in Barossa Valley, but you will forge on ahead. 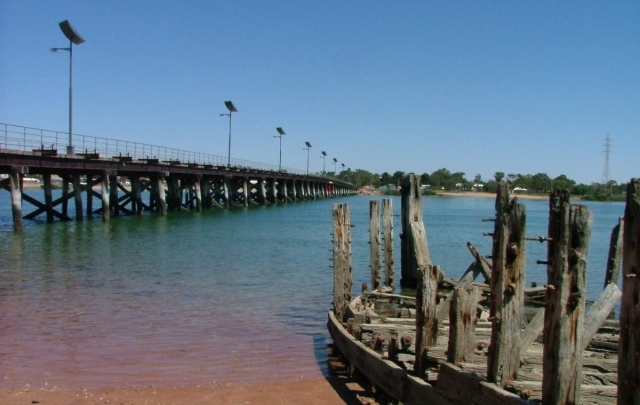 There’s not point in stopped for the next roughly three and a half hours, until you reach Port Augusta. Depending on how late you left, maybe this is where you will spend your first night. Otherwise, there are lots of amenities to get your first stock up on water, snacks, fuel, etc. If you’re the type that fancies a bit of touristy activities while you’re in new towns, there is a cultural centre, an outback centre, and even an arid lands botanical garden. If you’re ready to hit the road then hop back on the ol’ highway and head north. Crossing the quiet bridge into Port August. This next leg is about another two hours in which the scenery starts looking very shrubby and dry. The main thing to note here is that you need to make a right onto A87, Stuart Highway, for pretty much the rest of the drive. About 60 kilometres into this leg you’ll be able to stop at the Range View Rest Stop where there is a distance view across to Flinder’s Ranges. It’s amazing how far you can actually see when there aren’t houses and building towering over you. For the rest of the way, keep your eyes out for emu’s and their babies running along side the road. Eventually, you will arrive in Pimba. The distant view of the Flinder’s Ranges from the Range view rest stop. Pimba isn’t necessarily the most exciting stop on the road, but for that reason it makes for a good place to lie down and close your eyes, and you won’t feel too bad getting up early and leaving in the morning. There’s a roadhouse at the first petrol stop in Pimba, or you can head up a bit further to Woomera and sleep there. 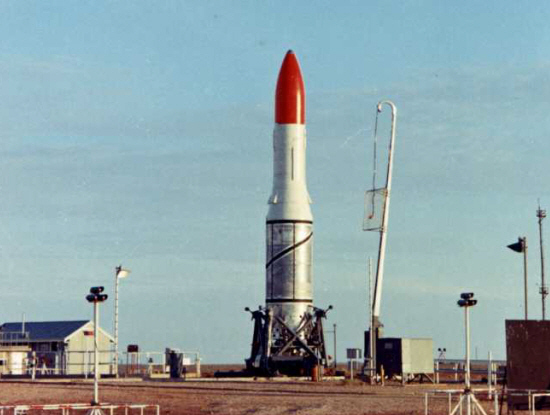 There was an old rocket testing program in Woomera many decades ago and you can still check out some of the old rockets. It’s also good to remember that everywhere you stop along this drive was home to the indigenous traditional owners, many of whom were forcefully removed from their land. Some of the remnants from the rocket test site in Woomera. When you leave Pimba, there is another stop at Glendambo less than an hour away, so it’s not too much trouble if you didn’t stock up. There should also be service with Telstra along this stretch. A really fascinating stop here is about 40 K out of Pimba at the Lake Hart Rest Area where you can gaze out upon the enormous salt lakes. It is definitely recommended to rest here for a moment and take in this rare view because the next leg is the longest you’ll have on the drive, without much of anything to stop for on the way. 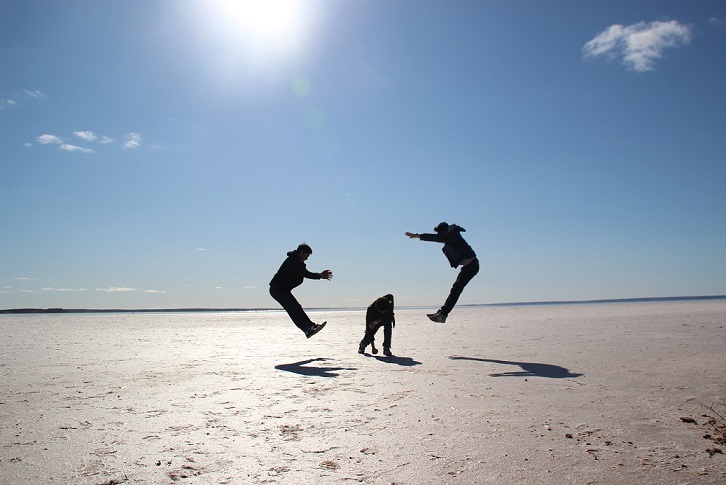 Some road trippers goofing around in the shimmering salt floor of Lake Hart. 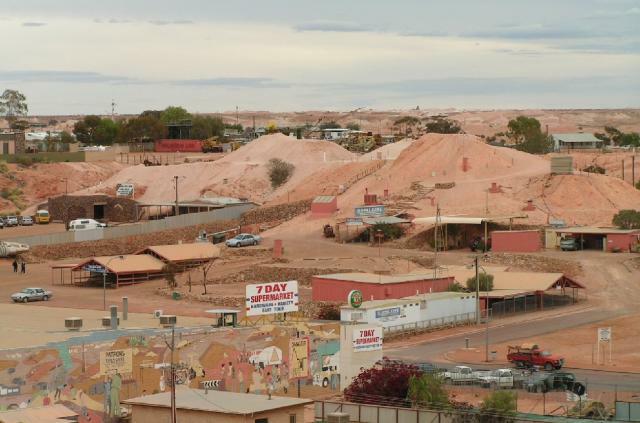 From Glendambo it takes about two and a half hours to reach Coober Pedy. There isn’t a lot to look at….this is a good time for those audiobooks and interesting passengers. Anyway, when you do arrive in Coober Pedy you’ll find that it’s actually quite a fascinating place. This might be surprising as the approaching scenery to this town is probably the flattest and most barren that you will see and you’ll probably have spent the last couple of hours feeling quite bored and uninspired. But rest assured that you are pretty much half way to Alice Springs already! And rest is the key word here. There is still a long way to go and this town is a little unique when it comes to accommodation. The illusory bleakness of the first glance into Coober Pedy. 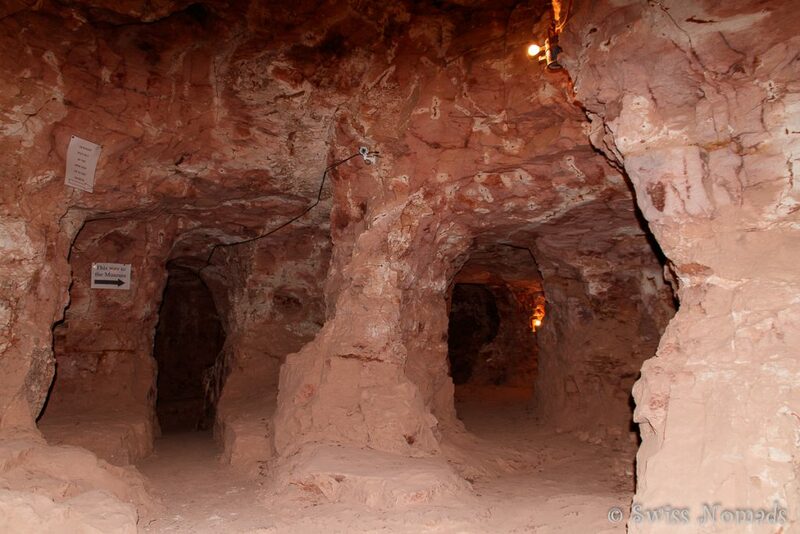 Coober Pedy is the largest opal mining town in Australia, and collects more than probably anywhere else in the world. As you drive closer to the town you’ll notice huge looming piles of the earth sitting above ground level, and these are the excavation piles created when clearing the mines. But don’t make the mistake of having a wander out to pick through and test your luck, there are keep out signs all along the way and you’ve got to book in for an official mining tour if you want to have a go. A good place for a tour is the Old Timers Mine from 1916, or you can just learn about mining at the Desert Cave Hotel. You can dig for your own opals at the Old Timer’s Mine. Now the absolute most fascinating part of Coober Pedy takes a little extra effort to see. And that’s because it’s underground! Walking around town you might notice that there aren’t many people or houses, considering there is an estimated population of 4,000. But delving a bit deeper, literally, you will find that there is an exciting life going on below the hot and dusty surface. And it isn’t all dark and dingy like you might imagine, in fact, the homes and hotels and quite charming and very liveable. There are even churches down there. No one seems to be worried about cave-ins in the slightest, as it seems sandstone is quite sturdy and strong, and the other upside is that digging you home means you completely bypass and complicated house plans or building issues. 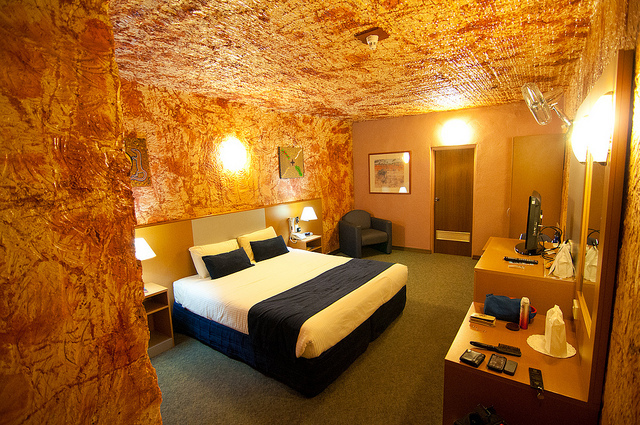 One of the luxurious underground hotel rooms where you can stay in Coober Pedy. This is the end of part 1 of this long and fabulous drive from Adelaide to Alice Springs, and perhaps you’ll want to extend your stay a bit longer before embarking on the second half of the journey. As an alternative to heading back up the highway, you can also elect a minor 620 Kilometre detour along the Oodnadatta Track. Some people caution that this is a tough and dangerous 4WD only kind of drive, but considering how remote it is it is surprisingly doable in a two-wheel drive. But definitely proceed with caution. And an upside to remote driving is that you can stop and camp for free pretty much anywhere that strikes your fancy. 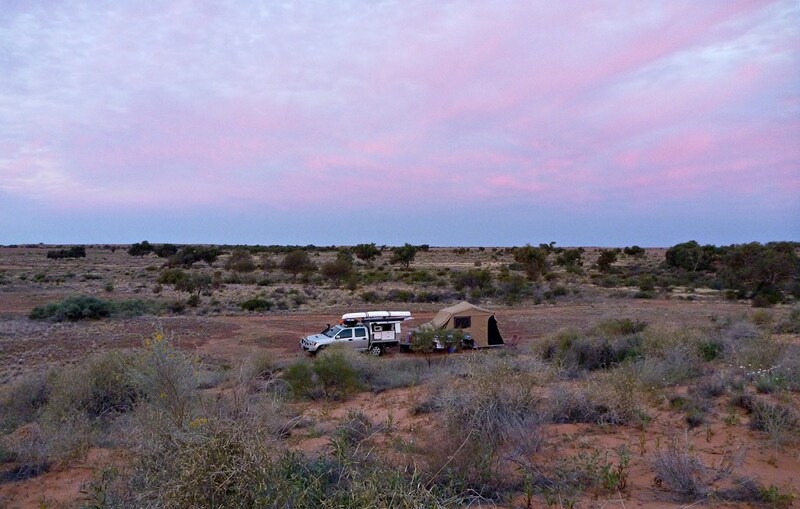 Free bush camping off the road along the Oodnadatta Track. 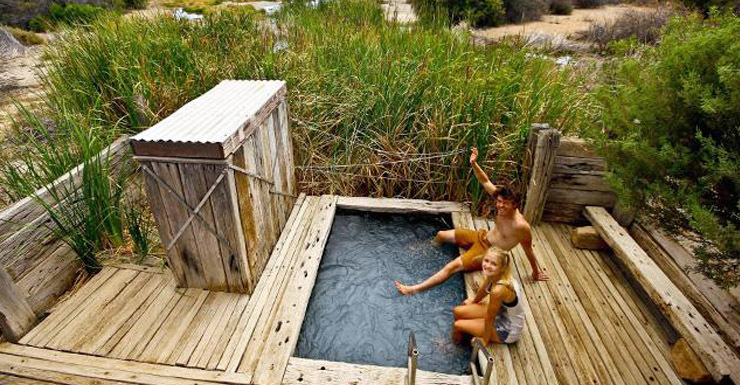 Take a dip in the natural hot tub at Coward Springs off the Oodnadatta track.